The Fostering Connections to Success and Increasing Adoptions Act of 2008 provided states with the option to operate guardianship assistance programs (GAP) as part of their child welfare permanency continuum under Title IV-E of the Social Security Act. 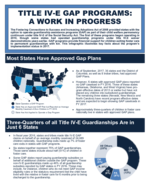 The first of these programs began operating in 2010, though some states had operated guardianship programs under title IV-E demonstration programs years earlier. GAP programs provide financial support for children exiting foster care to permanent guardianships with kin. This brief illustrates key facts about the program’s implementation status in 2017. Overall, 36 states plus DC and 8 Indian tribes have approved GAP plans. GAP has moved beyond its waiver program origins. However, program utilization is uneven and many states with approved guardianship plans infrequently place children in subsidized guardianships. Low utilization in some states may signal barriers to the program’s use that need to be identified and addressed.